This morning there was an article in the Springfield Newspaper announcing that the construction bids for the new Easthampton HS were $3 million lower than expectations ($30 million vs. $33 million - a savings to taxpayers of ~ 9%. This is similar to the savings achieved for the new Minnechaug HS and was attributed to the favorable bidding environment. What is the situation with the new Longmeadow HS project? 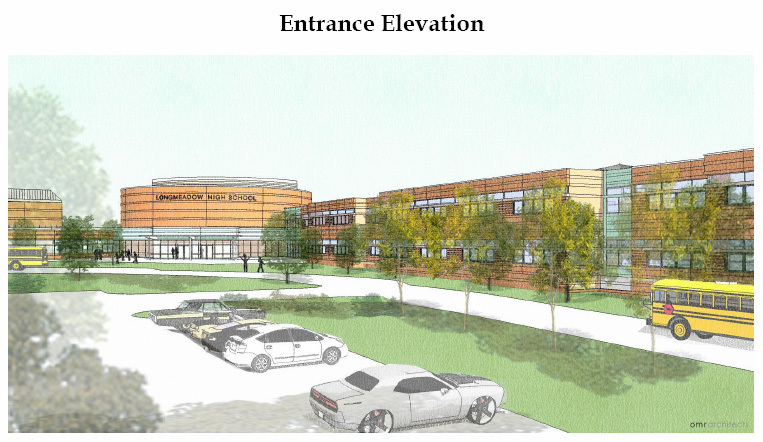 In a unrelatively unpublicized event, the new Longmeadow HS project bids were finalized at a School Building Committee meeting on May 12. As far as I know there has been no public notice or discussion of these results except during the end of the May 16 Select Board meeting when Mr. Barkett and Ms. Swanson (SBC co-chairs) provided a brief verbal project update (click here to view LCTV video, watch segment at the end of SB meeting). Question: Given that this SBC meeting took place almost two weeks ago why has this GMP information not been made public? The project Guaranteed Maximum Price- GMP (construction only) is $63.7 million + $14.7 million of soft costs (feasibility study + admin + architecture/ engineering + furnishings/ finish/ equipment + contingency costs) for a total of $78.4 million- ~$88K less than originally estimated and approved by Longmeadow voters. 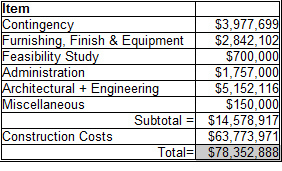 Below is table of the individual components for the $14.7 million of soft costs. Included with this price tag are 4 "add alternates" or "add-ons" to the original project scope. These add alternates (not in the original project scope) include an upgrade of the swimming pool area (diving board + floor tile), addition of an electromechanical lift mechanism for the auditorium stage (vs. original manual hydraulic system), an outside enclosed storage area, and an "exterior environmental gardenscape". Total estimates (quoted at the 1/05/11 SBC meeting) for these add alternates were $665K. Included with the the above "soft costs" are ~ $4 million of project contingency monies that will be used to resolve unforeseen project problems. Unless some of this money is not used and then later reallocated, there will be no synthetic turf installed as part of the high school project. Longmeadow elected to use a Construction Manager at Risk (CMAR) approach which provided a higher MSBA project reimbursement rate (+1.0% ?). Gilbane was approved as the project CMAR so there was no large number of "general contractors" bidding for the overall project... Gilbane was already selected. In the October - March 2011 time period Gilbane, the project architect (OMR) and the project manager (JLA) were involved in developing the final design + bid specification package. Gilbane/ JLA developed 3 sets of estimates (1 internal + 2 external sources) to use for comparing with actual bids on project components such as steel structure, electrical, plumbing, etc. The project bid specifications (including basic assumptions) were then issued and various contractors submitted bids for the individual components of the project. At the SBC meeting on April 28 it was announced that there were few bidders on certain project components (in some cases only one bid) and the bids were high so the bid deadline was extended. After the extended bid deadline passed, Gilbane selected the best ones and develop the Guaranteed Maximum Price or GMP. Gilbane (CMAR) is responsible for delivering the project building construction for $63.7 million which as I indicated in my comments above include 4 add alternates. Any savings in construction costs will benefit the individual contractors (steel structure, etc.). Overruns will be absorbed by the individual contractors. Gilbane is being paid a fee for managing the project. If the project runs into some unforeseen problems such as rock, asbestos removal, etc. that are not included with the original bid specs, the additional $4.0 million in the $14.7 million in other project costs will be used. Over that, the town has to ante up for overruns- without MSBA reimbursement. I believe the reason for the lack of publicity is that the SBC promised that if the project was quickly approved by town voters that a "good" bidding environment (from Longmeadow's point of view) would reap significant financial benefits. The SBC was able to include 4 add alternates to the original project scope without going above $78 million but this was much less than originally anticipated.